And girls, well, you’re overwhelmingly tired; you’re bloated; your tummy is all kinds of uncomfortable; your back is breaking; you’re happy one minute, sad the next; and all the salty, deep fried potato and chocolately treats in the world couldn’t satisfy you! PMS: Psychotic Mood Swings? Persistent Munching Syndrome? Puffy Mid Section? Well, yes – all of the above! Try not to disappear boys – understanding this stuff could come in quite handy next time crazy-eye takes over your lady friend! It’s that dramatic dip right before your period where your hormones are going cray, and you’re tagging along for the ride. BLAH! The not-so-well-known thing about PMS is that it’s actually not the norm or just plain old bad luck. In fact, the hormonal imbalances causing all the suffering related to your cycle are – more often than not – the result of habits, environmental toxins, and good ol’ stress! Obviously there are plenty of counter drugs available to help get you through “that time”, but I’ve never been one for jumping straight to the bandaid solution (plus I happen to be highly allergic to most of the standard pharma options), so today we’re going to look at a few NATURAL remedies and lifestyle factors that can seriously improve your symptoms for a much happier human when Aunty Flo comes to town – and all month round! There are (quite literally) hundreds of reasons why I recommend a quality Magnesium supplement to every single one of my clients, but there are a few PMS-specific reasons why this little gem is a must-have in your daily routine. The cramping associated with your cycle is often due to intense muscle contractions in the uterus as it does its thing to produce your period. Enter Magnesium: this guy is the most powerful relaxation mineral available, not only helping to ease the intensity of your cramps, but also improving your sleep to allow your body to rest and rejuvenate. Once again, fish oil is something that I recommend to pretty much every single client for maaannnyy reasons – especially for its natural anti-inflammatory properties. However, to stay on topic, let’s bring it back to women: when we don’t have sufficient amounts of essential fatty acids (EFAs), our menstrual system and our stress management system compete for what’s available. In this scenario the stress system always wins, leaving our hormones off balance and contributing to pain, mood swings, and multiple other nasty symptoms of PMS. By making sure your body has adequate amounts of EFAs available, you can offset this tug-of-war and therefore reduce those problematic symptoms that come with. Perfect! Stress contributes to Magnesium depletion and lack of Magnesium magnifies stress. Viscous circle, huh?! Think back to point one and start to understand how this can then contribute to a much more troublesome experience when that time of the month rolls around. 4. Eat quality, high fibre foods – especially your greens! We all know that fibre is super important to help keep you regular. And if you’ve been following my posts for a while, then you probably also know that Oestrogen Dominance is a huge contributor to bad PMS. What you might not know, however, is that constipation and issues of imbalanced gut bacteria can worsen this situation, as they can lead to the reabsorption of oestrogen back in to the blood stream even once your liver has tried to get rid of it. Maintaining a high fibre diet will help to keep your bowels regular, supporting detoxification and helping to keep those insides happy! Exercise is vital component to total health, including hormonal health. Maintaining a consistent, healthy level of activity all year round should be a priority for every single one of us, EVEN at that time of the month! You might not feel like going and smashing PBs at the gym – I totally get it – but try your best to at least go for a gentle walk or do some light yoga or stretching. The endorphin release from moving your body will help to alleviate pain and stress, and is a great little mood booster too! Calm your ovaries, ladies – this isn’t a free pass to go and eat your bodyweight in Nutella! But, there is actual benefits to treating yourself to a serving of QUALITY dark chocolate (minimum 70%) when Flo comes around. 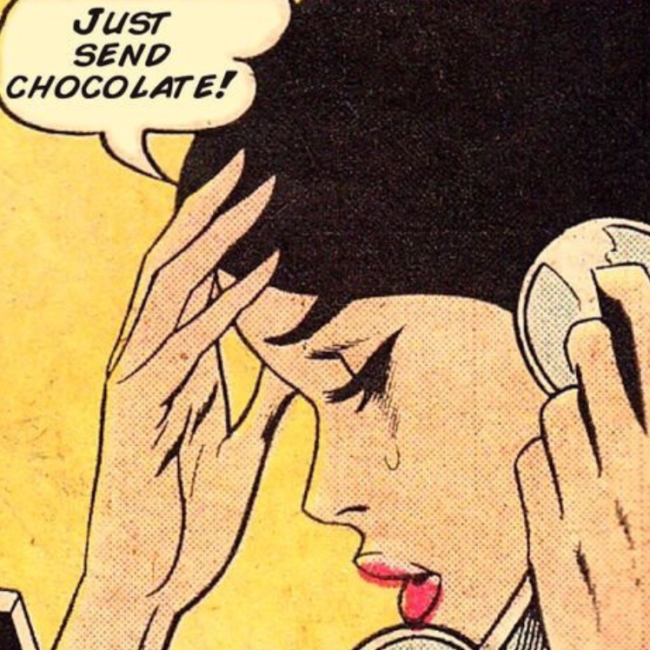 Not only will chocolate boost serotonin levels for an almost instantly better mood, but cacao is also a potent form of Magnesium which we now know is super important for alleviating symptoms of PMS. Treat yourself! IMPORTANT: PMS and severe pain are your body’s way of telling you that something isn’t right. If you’re symptoms are debilitating and seriously impacting on your every day life, stop putting up with it and visit a good, integrative Doctor or Natural Therapist to get control back over your hormones before they take even more control over you.